If you’re a recreational backcountry skier or splitboarder planning to enjoy the backcountry or slackcountry this winter, TuGo’s Emergency Medical Travel Insurance will cover you for misadventures both on and off the mountain, and on and off-piste too! Despite the dangers of this extreme sport, backcountry recreationalists can be covered by travel insurance. Skinning up, Nelson, BC. Photo credit: Petra Klupková. 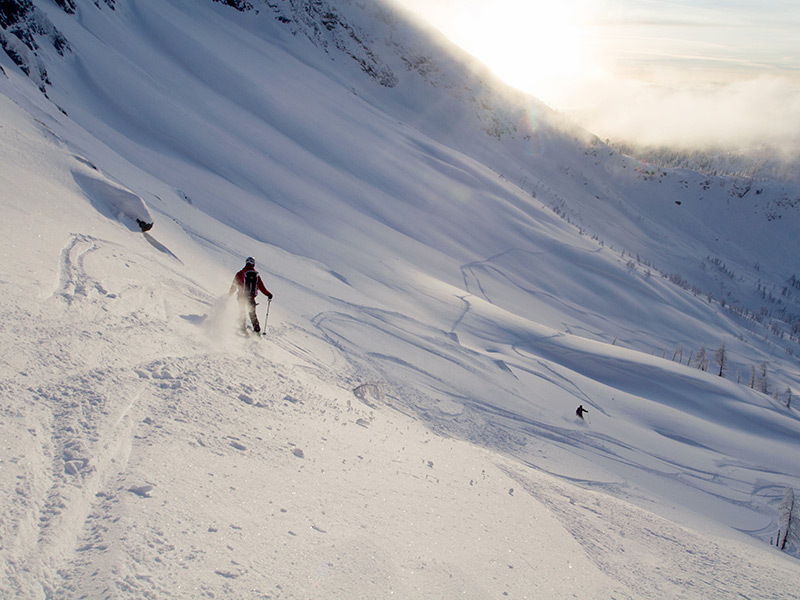 Not all policies will cover backcountry skiers, but ours does when you purchase the Adventure Sports Optional Coverage. Our partners, including the Alpine Club of Canada, offer coverage for all levels of backcountry ski-touring or splitboarding. As a backcountry skier, you spend a lot of time thinking about avalanche safety, following Avalanche Canada’s bulletins, practicing rescues and researching the terrain, all to avoid avalanches, of course. However, good backcountry trip preparation involves more than just life-or-death avalanche experiences. To be truly well-prepared, risks related to higher altitudes and injuries in case of accidents. Don’t just think of avalanches and consider other possible risks: exhaustion, hypothermia, dehydration, fractures, concussions, falling into tree wells, getting caught in unexpected weather or under falling rock, on the mountain or even just slipping in the parking lot before you even hit the slopes. Fresh Tracks, in Whitewater sidecountry, Nelson, BC. Photo credit: Thor Veen. 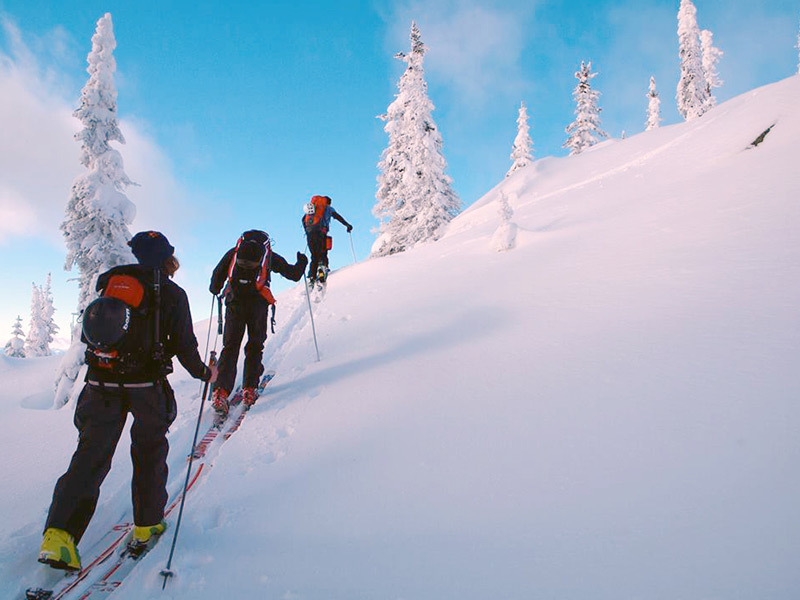 If you’re in a genuine emergency in the backcountry, your ski party members along with Search and Rescue (SAR) will likely be your first line of assistance. SAR volunteers will transport you to the nearest road or medical facility, but the ensuing ambulance rides, hospital expenses and follow up costs, (not to mention repatriation, trip cancellation or interruption costs), will be up to you. The cost of an air ambulance alone from a Search and Rescue station to a main hospital, for example, can come as quite a shock. It’s common for injured backcountry skiers to need a hospital transfer too; many of the small hospitals nearby don’t offer a full range of care. TuGo Travel Insurance covers licensed helicopter ambulances, a benefit you’ll need, as more often than not, an injury in the backcountry requires helicopter airlift. If you’re skiing out-of-province or across the border, don’t expect your provincial healthcare to cover all the costs of a medical emergency. Same goes for extended medical via group plan or credit card coverage. 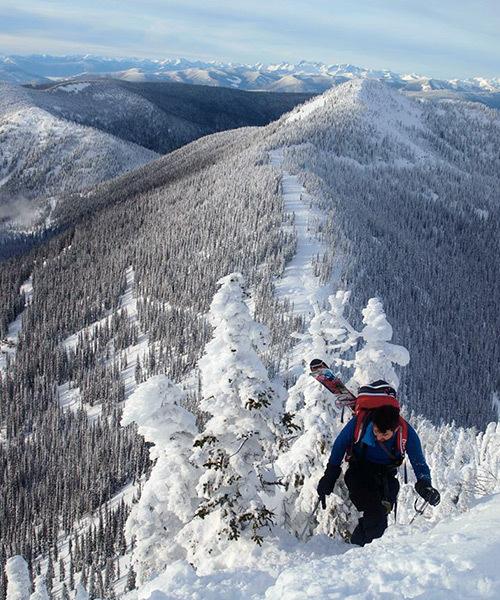 Have you ever asked HR or your credit card company if your plan covers backcountry skiing? Many Canadians are still surprised to learn that provincial healthcare covers very little out-of-province, and are often left with insurmountable bills. Provincial healthcare won’t cover ground or air ambulances, hospital transfers, or prescription medication. Travel insurance is especially necessary if you’re backcountry skiing in the US, one of the most expensive medical systems in the world. You can get coverage specific to USA travel, or if you’re just staying in Canada, be sure to mention that when you buy your insurance: travel insurance is much cheaper for Canadians travelling in Canada than in the US. Knowing this might even affect the choice of your next ski destination! Bootpacking above Whitewater Resort, Nelson BC photo credit Petra Klupková. Licensed ground, sea or air ambulance (without the hassle of needing pre-approval). Emergency air transport from one hospital to another, including from a US hospital to a Canadian hospital. This is particularly helpful for backcountry skiers in remote areas: if the hospital you’ve been transported to cannot adequately treat you, we’ll get you to one that can. If you travel often, a multi trip annual emergency medical plan is a good idea to save yourself time and money. You can get a plan that covers unlimited trips up to a certain length, and just pay once. Trip Cancellation and Trip Interruption insurance is also a great idea if you’ve purchased expensive plane tickets, rented vehicles, or reserved huts or hotels in advance. It will help you recuperate your costs if you need to cancel or interrupt your trip if you or someone in your ski party is injured or killed. Bootpacking up Whitewater Sidecountry. Photo credit: Thor Veen. Many travellers who backcountry ski have a hard time getting a straight answer from other insurers when they ask: “Do you cover backcountry skiing?” Technically speaking, it’s not illegal to ski out of bounds in Canada, but for most travel insurance providers, the defining line between out-of-bounds and off-piste or backcountry can be rather grey. At TuGo, we define backcountry as a “mountain area that is not marked, not patrolled and/or not cleared for avalanche dangers, but where public access is permitted.” We don’t cover “out-of-bounds”, defined as: “any mountain area that: Has been closed off to public access; or, Has been identified as “out-of-bounds” and/or can typically only be accessed by crossing a fenced, gated or roped-off area that has been marked as off limits according to recommendations of safety authorities in the area”. 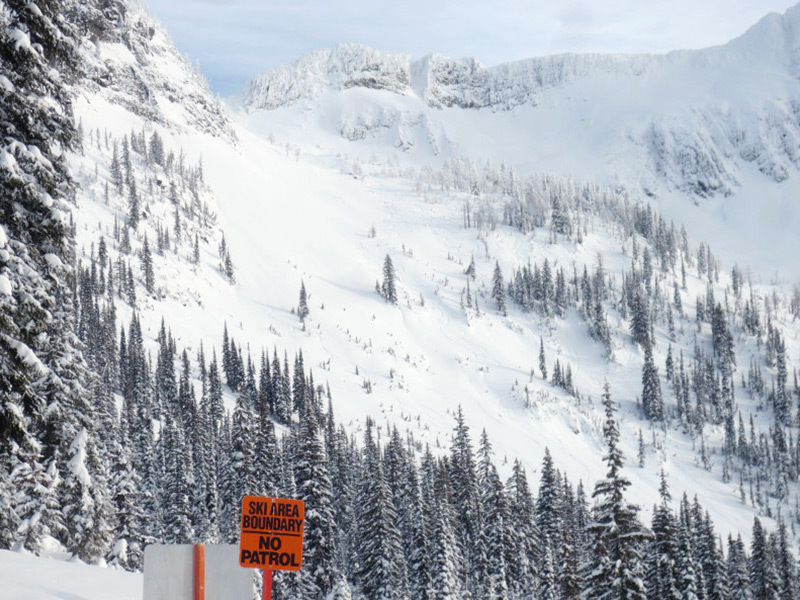 View of Whitewater Resort’s sidecountry and ski patrol boundary signs, Nelson, BC. Photo credit: Stephen Lerch. 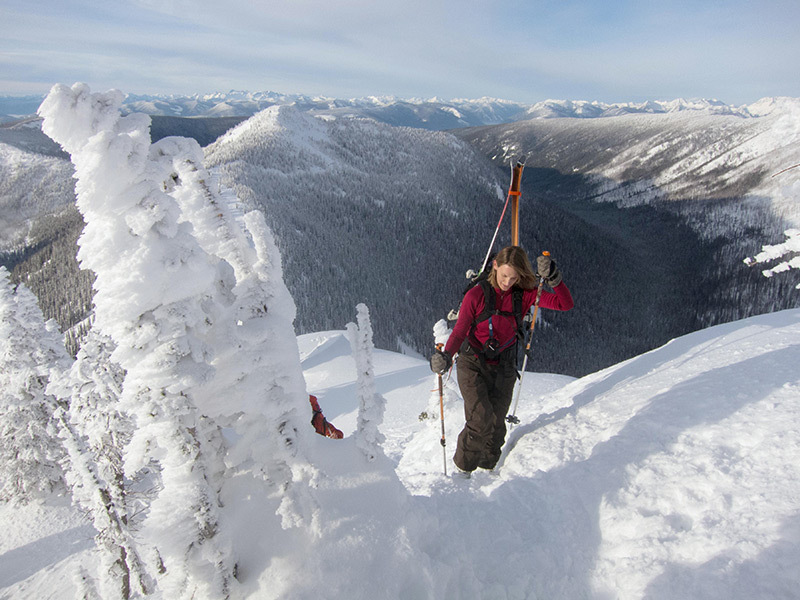 In essence, backcountry skiers know that looking for travel insurance coverage for backcountry skiing shouldn’t evoke a discussion about ‘rope-ducking’. Too often insurers get things confused. Responsible backcountry skiers have avalanche training, a high level of competence using self-rescue equipment (beacon or avalanche transceiver, shovel, probe), knowledge of the terrain and weather reports, and ski companions with the same safety knowledge and procedures. Rope duckers have none of that: they ignore warning signs and venture unprepared into unpatrolled terrain that’s likely “un-skiable”, dangerous, or impossible to access in rescue situations. Backcountry skiers knowingly accept the calculated risks, (and the majority return home safely), while rope duckers are simply ill-prepared for the risks. Trained backcountry recreationalists know rope-ducking without the proper avalanche safety training and equipment is just plain dangerous and unwise. Although Search and Rescue will rescue any injured or lost victim, SAR or the resort’s ski-patrol might charge irresponsible out-of-bound skiers for a costly rescue, like these rope duckers on Grouse Mountain in 2009. They were billed for their rescue costs and banned from the resort for life. Needless to say, travel insurance doesn’t cover this kind of thing. You’ll be happy to know that our Emergency Medical Insurance covers slackcountry skiing too if you purchase our Adventure Sports Optional Coverage. Telemark Skiing Whitewater’s Sidecountry, Nelson, BC. Photo credit: Thor Veen. If you’re one of many enticed by cheap lift tickets and easy access to side-country slopes, you’re not alone. Many Canadians and international travellers are trying slackcountry skiing, a hybrid on/off-piste sport. 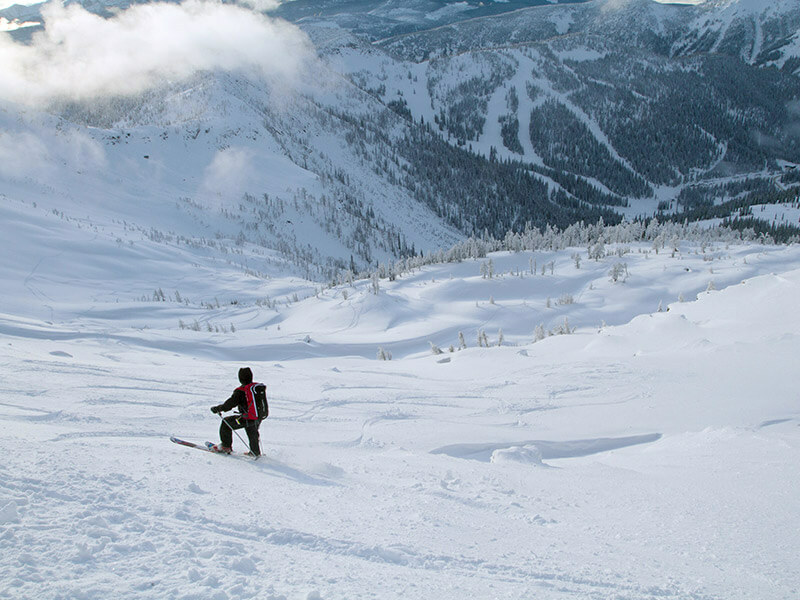 Resorts like Whitewater in Nelson, BC and the famous Whistler Blackcomb now blog about and advertise their passes with access to wilderness terrain. It’s a nice way to avoid the grueling “skin up” the mountain, but holds the same risks and dangers, so the same precautions for backcountry skiing apply. Like all self-propelled activities, backcountry skiing is about planning—route and gear selection, watching the weather, and keeping informed from our friends at the Canadian Avalanche Centre. Too often, we forget or ignore to plan for the unexpected consequences. With just a few clicks on a website, many of those contingencies can be easily arranged for a surprisingly reasonable price. Are you a member of the Alpine Club of Canada? Ask them about coverage for your next trip, or search for a broker near you on tugo.com. Enjoy those fresh tracks, and happy travels! Leah; How do I buy backcountry touring insurance as a visitor to Canada? I went to the ACC website, which linked back to TuGo, asked if I was a visitor, then got a bunch of options and packages, none of which state that backcountry cover is included or link to full policy documents. Thanks for your questions and comments. Glad to hear you’re coming to Canada to backcountry ski! Sorry to hear there was confusion and that you were frustrated; you were definitely on the right track though! You’ll want to purchase TuGo’s Visitor to Canada plan, which will provide Emergency Medical coverage while visiting Canada and does not specifically exclude recreational backcountry skiing. We don’t have any details about backcountry skiing in the policy wording, (which is why you may not have found any specifics within the Alpine Club of Canada’s online purchase site). situations. We definitely cover backcountry skiing! add this info into your email. our Visitor to Canada page: https://www.tugo.com/en/travel-insurance/visitors-to-canada/. Click on Emergency Medical Insurance, and then enter which province you’ll be skiing in, and choose a broker of your choice, and buy from them. You can always send us questions at info@tugo.com. We love comments—they help improve! Happy skiing, and we wish you a great trip! Thanks Leah! I will be snowboard touring in both Alberta and BC. Do I need a policy for each province? You don’t need a policy for each province. The Visitor to Canada plan covers you while you travel anywhere in Canada. If you’re buying online, choose whichever province you’re travelling to first, from any of our brokers across Canada. Thanks for your questions and happy to know that you’ll be visiting Canada to enjoy backcountry skiing! If you buy TuGo’s Visitor to Canada plan, the policy allows you to travel worldwide as long as you spend the majority of the coverage period in Canada. This also includes visits to your home country (or country of permanent residence). Please note, expenses won’t be covered during your visit/stay in your country of permanent residence. For example, if you’re visiting Canada from another country and are covered by our Visitor to Canada plan for 10 days, you can travel and will be covered in the US, as long as you spend at least 6 or more of the 10 days in Canada. 1. Visiting the ACC website and selecting the visiting Canada option. 3. Purchasing from our list of other brokers/partners across Canada. Click to our Visitors to Canada page https://www.tugo.com/en/travel-insurance/visitors-to-canada/ to select the broker and province of your choice. Wishing you an awesome ski trip! Thank you for your questions. Since policy and coverage details differ from case to case basis, we would be able to help you better if we knew more about you and your travel plans. For specific answers to your queries, please connect with our customer service team on our toll-free number 1-855-929-8846 or email us at info@tugo.com. Thanks and wish you a great ski trip in Canada!